At Robertson Family Dentistry, we value our patient relationships, making it our priority to deliver gentle compassionate care that you deserve from a dentist in North Royalton, OH. We work hard to make you feel at ease by providing exceptional patient care in a relaxed, convenient atmosphere. We strive to develop lifelong relationships with our patients by combining the latest dental technology with a professional and compassionate staff. The result is a beautiful, healthy smile that lasts a lifetime. We also believe that patients should have sufficient information to make educated decisions about their oral health, treatment options and choice of dentist in North Royalton. You'll find all of this important information on our website, including directions to our North Royalton, OH office, service descriptions, patient forms, patient education resources and more. Robertson Family Dentistry's team takes pride in establishing a comfortable and personal relationship with all of our clients. We pride our office in being a “Family Friendly Dental Office” to serve the needs of all ages. We do everything that we can to make sure you’re as relaxed and comfortable as possible while receiving treatment. 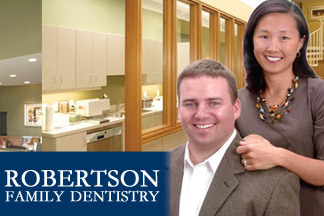 Dr. Anita & Dr. Kevin as well as their staff have spent many years developing and incorporating high quality dentistry. Your smile is important. It’s one of the first things you notice when you meet someone. A whiter, brighter smile is beautiful – it can help you feel better about yourself and make a memorable impression Your lifestyle and the aging process can stain and darken your teeth. Many things we do throughout our day can change the color of our teeth. For instance; coffee, red wine, or tea are the biggest contributors to stain and discoloration. Ask us how you can leave our office with a noticeably brighter and whiter smile. Dr.'s Kevin and Anita Robertson met in Dental School at The Ohio State University School of Dentistry. They have been practicing in North Royalton for over a decade, improving lives one smile at a time. For more information about Dr.'s Kevin and Anita Robertson go here. "Outstanding procedures, extremely high quality service and expertise. All personnel and the facility are top notch. I recommend this organization to all my friends. Had a porcelain crown done. Best procedure ever. This was not my first crown."